Being in a multi-vehicle car accident can be terrifying, especially if it involves a chain reaction of 10 or more vehicles. These accidents can result in a highway or road being closed for hours. A victim’s car can be smashed multiple times as more vehicles crash into each other. As a result, people can suffer catastrophic injuries or die in these wrecks. In addition, determining who the negligent drivers are—often involving more than one motorist—can be challenging. That is why hiring an experienced car accident attorney is essential to obtain the compensation you deserve. Intersection crashes. When one driver is hurrying through an intersection and hits another vehicle, he can set off a chain reaction if his vehicle or the one he hits collides with other vehicles traveling through the intersection. Highways. Multi-vehicle accidents on highways are especially dangerous given the high speeds involved. These wrecks can quickly turn into a massive pile-up as drivers must try to swerve out of the way of other stopped vehicles. Rear-end collisions. Rear-end collisions are common in pile-ups as vehicles collide with the stopped row of cars. Why Do People Cause Multi-Crash Accidents? Weather conditions. 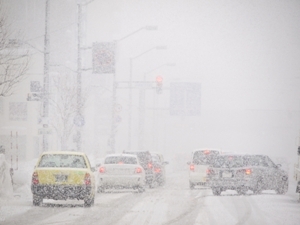 Drivers often cause a multi-car crash when they fail to drive safely for the weather, such as in heavy rain, fog, ice, and snow, which make visibility poor and the roads dangerously slick. Speeding. Speeding always increases the likelihood of serious injuries because the force of the impact is greater. This can also hurl the hit vehicle into another one, setting off a deadly chain reaction. Drowsy driving. When a driver is drowsy or falls asleep at the wheel, he may not recognize the need to slow down or stop or can veer into oncoming traffic, with a multi-auto accident being the result. Tailgating. Like when speeding, a driver who is tailgating the vehicle in front of him simply has insufficient time to slow down or stop before causing a rear-end collision that can result in more vehicles being involved in the crash. Distracted driving. Whenever a driver is focused on talking on his cellphone, texting, or eating and drinking, he is not aware enough of the vehicles around him and can easily cause a crash that can turn into a multi-vehicle one. Rubbernecking. When drivers are looking at another accident instead of their own, they can cause an even worse crash, sometimes causing a pile-up. Construction zone driving. If drivers fail to slow down in a construction zone, a multi-vehicle crash could be the consequence, especially given the narrow lanes and heavy traffic in these work areas. You will be at a serious disadvantage if you do not retain an experienced car accident attorney soon after your accident. You need an attorney who can investigate the accident and determine who the liable parties are. He may need to hire an accident reconstruction expert to assist in this investigation. Hiring an attorney quickly ensures that he or his expert can visit the crash scene soon after your accident to understand how the crash occurred and possibly discover important information that could prove a driver’s negligence. He can also take steps to preserve vital evidence, such as witness statements and possible surveillance or red light camera video footage of the wreck. In addition, it is essential to have an attorney negotiate your settlement if you were involved in a multi-vehicle accident. He may need to negotiate simultaneously with more than one insurance company at the same time. He will also need to deal with the fact that multiple victims may have been injured and could be seeking compensation from the same pot of money. An experienced attorney will understand the need to look at all insurance policies—including your own—so that you obtain the full compensation you deserve. If you purchased collision, underinsured motorist coverage, or MedPay coverage to pay your medical bills, he can help you file a claim and negotiate your settlement with your insurance company for you. If you were injured in a multi-vehicle accident, Christopher Hudson can investigate the cause of your crash and assist you in obtaining the compensation you are entitled to. Contact us onlilne, start a chat or call us directly at 706.863.6600 to schedule your free consultation to learn about your legal options. For more information download your free ebook "Understanding Georgia Automobile Accident Claims". This absolutely free resources is filled with information you need to know after being involved in a car accident.